Hello! Welcome to Tin Top Ranch Trailriding. 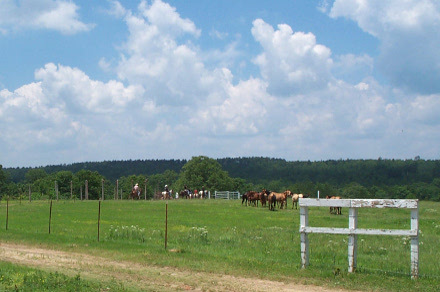 We are a 160 acre ranch located in the beautiful Ouachita National Forest of southwest Scott County, Arkansas. We have a unique opportunity to provide you with a quiet, secluded retreat where you, your horse and a few friends can get away from it all. It's not hard to do in the middle of 1.8 million acres of forest. Our ranch house has a complete kitchen, dining area, three bedrooms and two baths. There is also a half-basement outfitted as a bedroom. A cozy wood-burning fireplace will provide comfort on chilly evenings, and after a long day hunting or trail-riding. Or, gather your friends for a friendly game of pool at the pool table. Like to star-gaze? You'll never see a night sky until you see the skies at Tin Top. So what can you do at Tin Top Ranch? We have organized trail-riding several times a year, but you're welcome to bring your horses and explore the wilderness on your own. During hunting season, there are hundreds of thousands of acres of national forest within a short distance. Deer, turkey, squirrels, rabbits, quail... it's all here. Like to fish? Catch a mess of pan-fish in one of the stocked ponds and local creeks. Primitive Camping available during special events. For more information or to reserve your weekend or week-long vacation, call 1-800-436-8199. © 2015 - Tin Top Ranch Trailriding - All rights reserved.